WILKES-BARRE -- The King's College football team will look to register a second straight win when the Monarchs make the trek up Route 309 to take on local Middle Atlantic Conference rival Misericordia University Saturday at 1:00 p.m. at Mangelesdorf Field. King's returned to the field last week after a bye week, making its first home appearance in a month and walked away with a 30-26 win over Lycoming. The bye week was extremely helpful for King's, which played he game without a number of injured starters, including starting quarterback Tom Hehre. The Monarch signal-caller returned to the line-up and promptly earned MAC "Offensive Player of the Week" honors after leading King's comeback win over Lycoming. Hehre completed a career-high 24 passes on 38 attempts for a career-high 231 yards with two touchdowns. The senior also rushed for 37 yards on nine attempts with one rushing touchdown and piloted the Monarchs to a pair of scores on the final two drives of the game. Today is game-seven for both King's College and Misericordia University and also the sixth game of the MAC schedule. The Monarchs enter the contest with a 2-4 overall record and are 2-3 in the MAC. Misericordia is 0-6 and 0-5. This is the fourth all-time meeting between the teams with King's holding a 3-0 advantage. The Monarchs won last season's contest 36-29 at home. 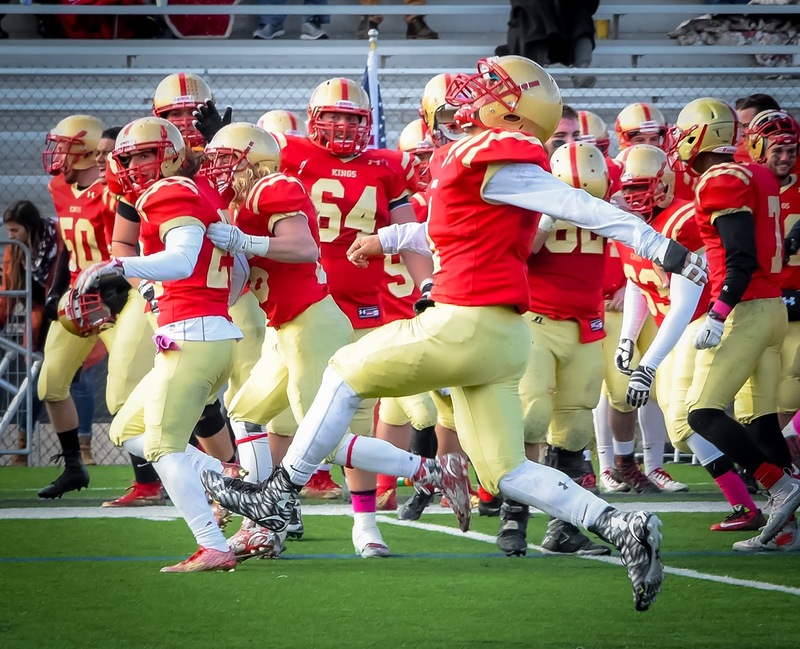 In 2013, King's won 41-40 in an overtime thriller in the last meeting at Manglesdorf Field. Monarch mentor Jeff Knarr is in his sixth season at King's and owns a 16-40 career record. Misericordia coach Mark Ross is in his fourth year and is currently 2-34 since starting the Cougar program in 2012. King's snapped a two-game losing streak with a thrilling 30-26 come-from-behind victory over Lycoming at home. The Cougars went on the road and dropped a 40-10 decision to Widener University. The Monarch offense is last in the MAC in averaging 265.0 yards of total offense per-game. The Monarchs are seventh with 171.2 passing yards and eighth in rushing at 93.8 yards each contest. Senior quarterback Tom Hehre, is sixth in MAC passing efficiency at 97.1 per-game. He has completed 95-of-167 passes for 825 yards with three touchdowns and six interception He has also rushed for 128 yards on 50 attempts with five touchdowns. Freshman tailback Gabe Brownowns a team-high 335 rushing yards on 87 carries with three touchdowns. Brown has also caught eight passes out of the backfield for 30 yards. Junior Zack Funk adds 122 yards on 34 carries with one score. Junior Mike Palmer tops the receivers with 30 catches for 349 yards and three touchdowns while sophomore Matt Demarco, a transfer from Division I-AA Monmouth, follows with 24 receptions for 181 yards. Sophomore split end Marquis Miller has 22 catches for 170 yards while fellow sophomore Tyler Marroni has nine receptions for 100 yards. King's returns four offensive line starters, including senior center Mark Vetterlein, senior tackle Evan Foster, junior guard Andrew Zub, and junior tackle Jake Dever. The Misericordia offense is ninth in the MAC in total yards with 285.5 yards each game. The Cougars are fourth in rushing with 156.0 yards and ninth in passing at 129.5 yards each contest. Leading the Cougar offense is dual-threat senior quarterback Jeff Puckett. Puckett has rushed for a team-high 525 yards on 120 carries with five touchdowns while also completing 75-of-155 passes for 762 yards with five touchdowns and eight interceptions. Junior tailback Blake Bowman tops the running game with 431 yards on 95 attempts with a 4.5 yards per-carry average with five touchdowns. Junior running back Ryan Kurtz adds 251 yards on 66 carries. and has caught 13 passes for 107 yards and one touchdown. Sophomore receiver Mark McMaster tops the receives with 22 catches for 237 yards and one touchdown. Junior wide-out Colton Pyne follows with seven catches for 31 yards while senior receiver Juwan Petties-Jackson has caught five passes for 83 yards.Senior receiver Tyler Rowe and senior tight end Thomas Stelzer have caught six passes each. The Monarchs defense enters the game ranked seventh in total MAC defense, allowing 383.8 yards of total defense per-game. King's is eighth against the run in yielding 199.2 yards while standing fifth against the pass in permitting 184.7 yards through the air. The group is led by senior defensive end Michael Martina who tops the team with 40 tackles, 7.5 tackles for loss with 6.0 sacks and one forced fumble. JuniorBobby Russell, a 2014 All-MAC selection at linebacker, has made 37 tackles with one interception, two fumble recoveries, three forced fumble, one sack, and one blocked field goal. Sophomore safetyJake Manetti follows with 36 tackles and two interceptions while senior safety Anthony Martuccio adds 34 tackles with an interception and two forced fumbles. Senior linebacker Chad Curtice has registered 26 tackles with 5.0 tackles for loss with 2.0 sacks while sophomore linebacker Hassan Maxwell has 24 tackles with 2.5 tackles for loss. Senior linebacker Monroe Sherman has contributed with 16 tackles. Senior cornerback Justin Burke and sophomore cornerback Justin Foster each have 15 tackles. Senior linebackers James Burke has made 14 tackles while sophomore lineman Jacoby Foresman also has 14 tackles with 5.0 tackles for loss and 3.0 sacks. Senior cornerback Tyler Mejasic chips in with 12 stops. The Misericordia defense is ranked last overall in the MAC in allowing 457.8 total yards each game. The Cougars are last versus the run in yielding 264.5 yards on the ground and are sixth against the pass in allowing 193.3 yards every contest. Sophomore safety Tyler Collins tops the squad with 43 tackles and 2.5 tackles for loss. Senior linebacker Hunter Pates follows with 37 tackles with 1.5 tackles for loss. Senior linebacker Sean Weg adds 34 tackles while senior safety Brandon Salazar has contributed 31 stops. Senior cornerback Kevin Bagasevich has posted 27 tackles with two interceptions while senior linebacker Dom Picarillo has tallied 26 tackles with 2.5 tackles for loss.